England’s record-breaking World Cup win against Panama in Nizhny Novgorod sets up a winner-takes-all final Group G game with Belgium in Kaliningrad on Thursday. Gareth Southgate’s squad delivered an impressive show of firepower to beat Panama 6-1 and send optimism soaring as the World Cup knockout stages come into view. But can the Three Lions continue their momentum against Belgium and then into the last 16? The sight of Jesse Lingard ball-juggling on the bench alongside the rest of the England squad as they closed out their biggest win at a World Cup finals illustrated the mood of Gareth Southgate’s squad. England have been relaxed and comfortable since they drove through the gates of their Repino hideaway on the Gulf of Finland – and this emphatic victory over Panama was another powerful statement of intent. Southgate’s pre-match claim that his side had produced performances to match any other so far at the World Cup may be challenged by Croatia after their win against Argentina, and by their next Group H opponents Belgium, after the manner in which they put away Tunisia. How did England players rate against Panama? England have, however, produced displays that have not only gleaned maximum points but lifted confidence and national expectation to levels unknown in recent years. There is good reason for the joy and optimism, although it must also be placed in context by the mediocre opposition they faced in Tunisia and then the undisciplined Panamanians. England’s positive and upward progress can also be measured against the low point of the humiliating departure from Chantilly in France two years ago, when they beat an embarrassed retreat from their base after losing to minnows Iceland in the last 16. Manager Roy Hodgson resigned on the spot and Southgate stepped in after Sam Allardyce’s one-match reign. He has built a squad based around youth bolted on to a system and style of play he believes can show the football world another side to England’s character away from the fighting spirit and passion that has been their long-time default position. And so far, in the searing heat of Volgograd and Nizhny Novgorod, it is all going to plan as England, led from the front by a player and personality in Harry Kane who personifies the new era Southgate wants, flourish and improve. Kane is the tournament’s leading scorer and a natural fit as captain, Lingard can produce match-changing moments and all is serene as Southgate keeps his cool amid the noise of this Russian World Cup. England’s supporters cannot get carried away as much more will be learned against Belgium and then further into the competition – but there is a new confidence and belief Southgate and his players can take forward in their transitional state irrespective of future events here in Russia. Which records did England break in 6-1 win? England have done little to secure a place in the nation’s affections for many years – probably since the onset of ‘Roomania’ when the 17-year-old Wayne Rooney burst on the scene at Euro 2004. The litany of failures at World Cups in South Africa in 2010 and Brazil four years later – when a 4-1 beating by Germany in the last 16 was followed by a failure to even advance from the group in South America – hit its nadir with that Euro 2016 loss to Iceland. Spirits have slumped as opposed to lifted. Southgate, a civilised and mature personality even before you start to examine his England managerial credentials, is a measured individual whose presence has done much to repair that wreckage and change the feeling towards this England team. And backed by an England squad containing a combination of varying personalities, from the joker Lingard to the under-stated (at least off the pitch) captain Kane, Southgate is over-seeing a team the nation is learning to love again. This can all change with one result or poor performance – but the upbeat mood here in Russia is reflected back home and England’s players are well aware there is a growing fund of goodwill towards them. Southgate will not let expectations get out of hand but he is happy to let hopes rise and for England’s fans to indulge in some blue-sky thinking. As he said, while referring to his own running accident: “I’m not going to put people off celebrating their wins. England’s football followers have had a lot to be modest about in recent times but there is the growing sense the nation likes this team. Southgate even defied the pain from his dislocated shoulder to go over and punch the air in celebration with England’s supporters. There seems, at last and at least for now, a growing connection between this England team, manager and those who follow them. It could all come tumbling down inside 90 minutes further down the line – but the bigger picture is that this is a growing, promising England and it would take something catastrophic to change the belief they may be on to something good, come what may in Russia. England have played themselves into this World Cup in impressive fashion with maximum points from two games against Tunisia and Panama – now comes the serious business. Belgium – their final opponents in the group phase – moved to a higher level from their opening win against Panama as Tunisia were beaten 5-2, with the threats of Romelu Lukaku and Eden Hazard flourishing alongside the intelligence of Kevin de Bruyne. 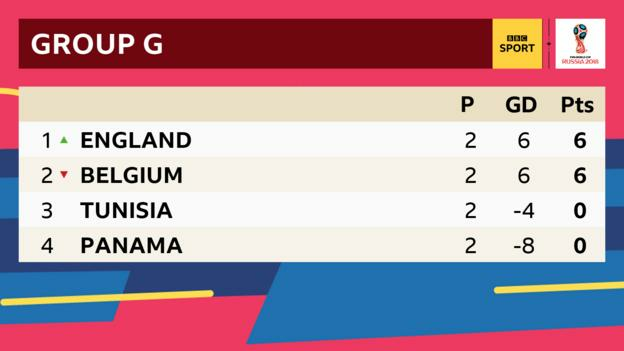 The fight for top spot in Group G will, as expected, go down to the final game in Kaliningrad on Thursday with England only ahead by virtue of a slightly better disciplinary record. England’s defence has actually been used as an attacking weapon so far, with John Stones scoring twice and Harry Maguire’s sheer physicality unsettling both Tunisia and Panama. From now on they, along with the third man in that defensive unit Kyle Walker, may have to focus on traditional duties much more. Belgium manager Roberto Martinez has hinted he will make major changes to his line-up, with both Lukaku and Hazard picking up knocks, but his true intentions will only be revealed when his team is named. England’s attacking threat has been in evidence throughout this Russian campaign – it is at the other end where they have yet to be seriously examined. Everton goalkeeper Jordan Pickford has barely had a save to make – having no chance with the two goals conceded but giving Southgate the extra dimension he demands with the ball at his feet. And significantly, the standard of opposition conducting those examinations will rise from now on. England were careless on occasions against Tunisia, which will be punished further down the line at the World Cup, while even Panama unsettled them a couple of times in Nizhny Novgorod – although it must be stressed they were cruising on a 6-0 lead so perhaps that was understandable. Amid the euphoria, there must be a note of caution as the full extent of England’s progress may now be about to be probed in a manner it has not been probed before. England also have an extra layer of responsibility to contend with as they prepare to face Belgium, thanks to the vagaries of the group table. If England draw against Belgium, who tops the table will come down to fair play records – and if that is level, lots would be drawn. England have collected two yellow cards – Kyle Walker against Tunisia and Ruben Loftus-Cheek here – while Belgium have three yellow cards against their name. Southgate will hope the conclusion is reached by conventional means and England can continue to ride a wave of positivity. The performance against Panama certainly ensures that will continue as they go back to work in Zelenogorsk before their stiffest test of the World Cup so far.